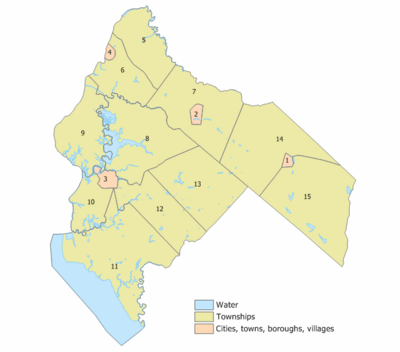 Salem County is a county located in the U.S. state of New Jersey. 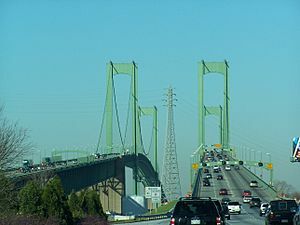 Its western boundary is formed by the Delaware River and it has the eastern terminus of the Delaware Memorial Bridge, connecting to New Castle, Delaware. Its county seat is Salem. The county is part of the Delaware Valley area. As of the 2016 Census estimate, the county's population was 63,436, making it the state's least-populous county, representing a 4.0% decrease from the 66,083 enumerated at the 2010 Census, in turn increasing by 1,798 (+2.8%) from the 64,285 counted in the 2000 Census, retaining its position as the state's least populous county. The most populous place was Pennsville Township, with 13,409 residents at the time of the 2010 Census. Lower Alloways Creek Township covers 72.46 square miles (187.7 km2), the largest total area of any municipality. As of the census of 2010, there were 66,083 people, 25,290 households, and 17,551 families residing in the county. The population density was 199.1 per square mile (76.9/km2). There were 27,417 housing units at an average density of 82.6 per square mile (31.9/km2)*. The racial makeup of the county was 79.83% (52,757) White, 14.09% (9,309) Black or African American, 0.36% (240) Native American, 0.84% (557) Asian, 0.02% (10) Pacific Islander, 2.64% (1,745) from other races, and 2.22% (1,465) from two or more races. [[Hispanic (U.S. Census)|Hispanic or Latino of any race were 6.82% (4,507) of the population. In the county, the population was spread out with 23.5% under the age of 18, 8.2% from 18 to 24, 23.9% from 25 to 44, 29.4% from 45 to 64, and 15% who were 65 years of age or older. The median age was 40.8 years. For every 100 females there were 94.9 males. For every 100 females ages 18 and old there were 91.6 males. Salem is served by many different roads. Major county routes include CR 540, CR 551, CR 553 (only in Pittsgrove) and CR 581. State highways include Route 45, Route 47, Route 48 (only in Carney's Point), Route 56 (only in Pittsgrove), Route 77 and Route 140 (only in Carney's Point). The U.S. routes are U.S. Route 40 and the southern end of U.S. Route 130. Limited access roads include Interstate 295 and the New Jersey Turnpike. Both highways pass through the northern part of the county. Only one turnpike interchange is located in Salem: Exit 1 in Carneys Point (which is also where the turnpike ends). There are a pair of service areas on the Turnpike, both located between exits 1 and 2 in Oldmans Township: The John Fenwic Service Area on the northbound side and the Clara Barton Service Area in the southbound direction. Salem County, New Jersey Facts for Kids. Kiddle Encyclopedia.